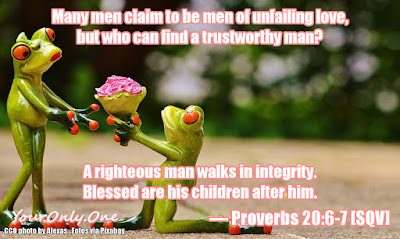 7 A righteous man walks in integrity. To the extent possible under law, Yukia Yahohanan Sese Cuneta(雪亮) (יהוחנן) (謝) (Cuneta)(ゆきあ)(Xuěliàng) (Xie) has waived all copyright and related or neighboring rights to this image macro entitled: On Unfailing Love by Men. This work is published from: Philippines. Photo by Alexas_Fotos released under CC0/Public Domain.